Instagram is on the rise today. With more than 700 million total monthly active users, there are 8+ million accounts that have switched for business profiles. What does this mean for the modern-day business owners? Instagram has grown into more than just a fun social media channel where people share images and videos from their everyday life. It has evolved into an effective mobile-based social media platform that helps the brand reach targeted demographic, engage more customers, promote their products or services, grow revenue, and drive real social value. Running a business profile on Instagram and engaging with your fans there, you need to develop a consistent and well thought-out business strategy and content plan. You need to be recognizable by your target audience. You also need to bring certain value through all pieces of content that you share in the feed. 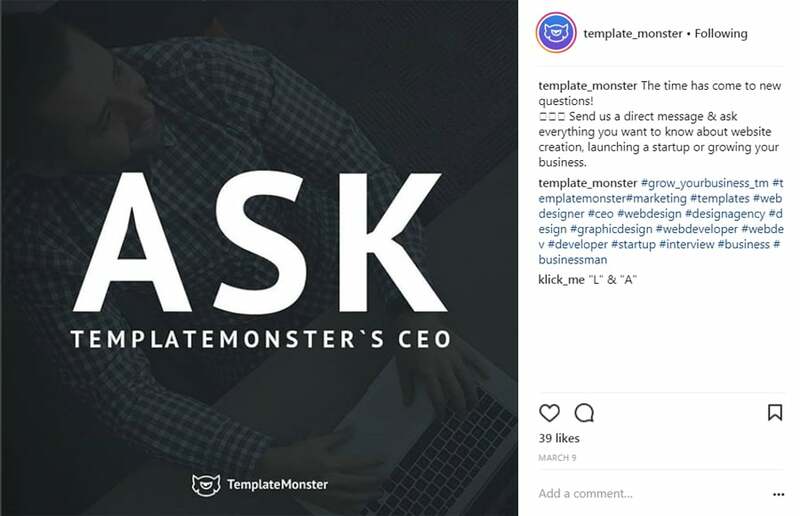 In order to help you develop an effective Instagram marketing strategy, we’ve compiled a list of the must-try Instagram post ideas for a business that will help you create a smart Instagram content plan. Developing a content strategy plan on Instagram seems to be quite simple, though it’s often overlooked by brands. on what days and at what time you’re going to make your posts go live. We have already spoken about the importance of choosing the right themes for business Instagram profiles in the previous guide. Working on the content strategy for your page, consider picking the right Instagram theme that will help you create the brand look and stand out from the competition. Different visual styles have different effects on different audiences. 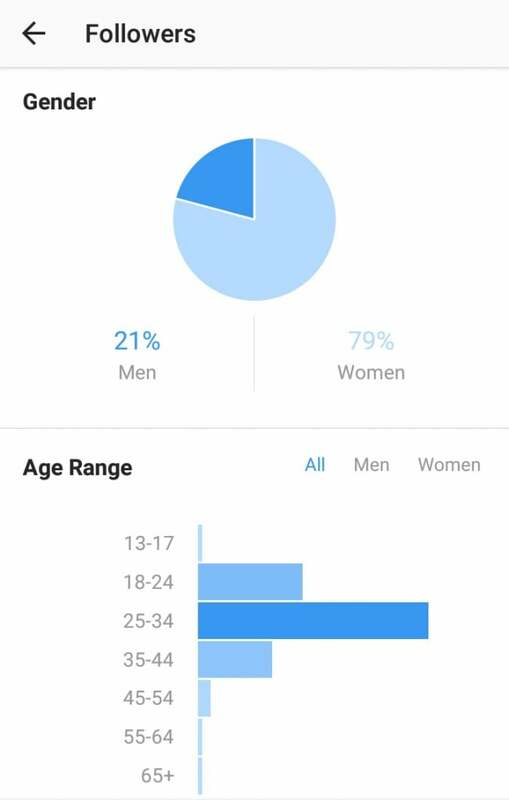 So, you will need to use Instagram analytics tools in order to discover what has a better effect on your target audience. For example, you can use Sprout Social to see what particular kind of content drives the higher user engagement. 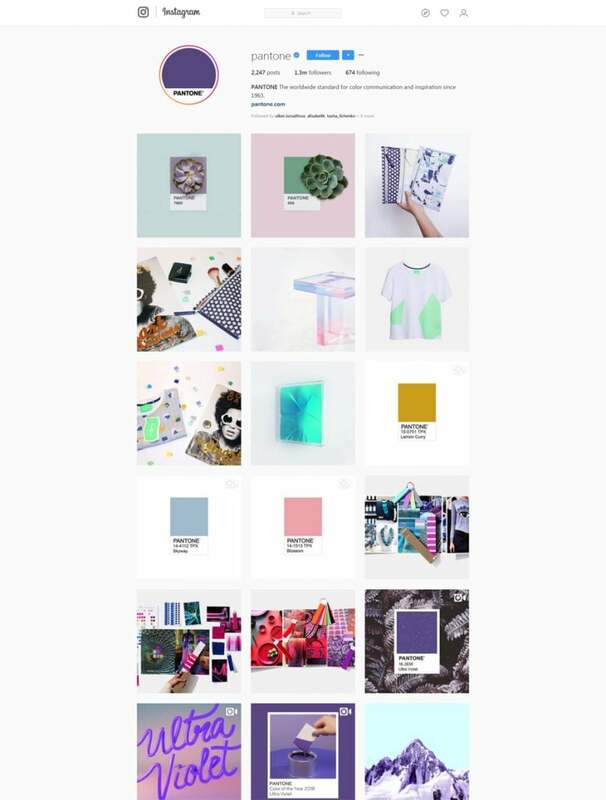 What Pantone did is choosing the Instagram theme that aligns with the brand voice and the visual style of the company. The use of the bold purple color scheme makes the content stand out in the Instagram feed, thus bringing more click and traffic to the brand. If you want the audience to love you, keep a close eye on your updates, and remain curious about all the things connected with your brand, you need to appear in their news feeds as frequently as you can. Just recollect how many times does your favorite fitness club share motivational posts on Instagram? Is that every single day or a couple of times per day? In order to keep followers engaged with your content, you need to remain within their sight 24/7. Bringing certain value to your followers and being consistent in everything that you share in the feed are the two major factors that you need to keep in mind in order to generate the maximum audience engagement. 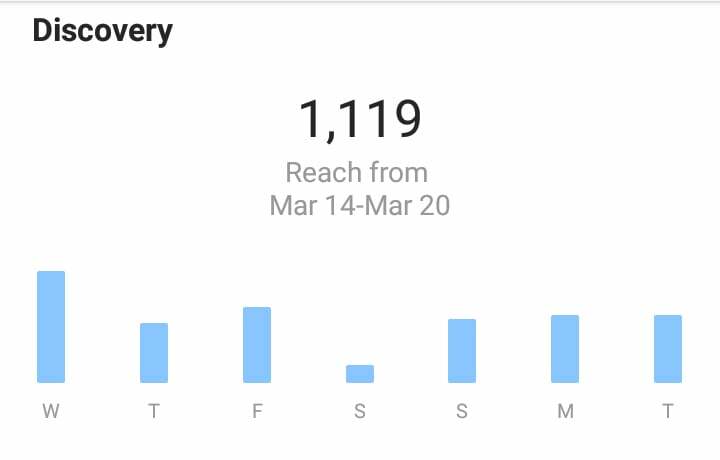 Posting a quote, image or video once a week and then leaving your followers without any updates for a month will hardly keep you relevant to your audience. You become a stranger whom your followers can confuse with the competitive brands. It’s up to you to decide the frequency at which new posts will appear on your Instagram profile. The thing to remember is that if you decide to share posts 3 times per week, you should keep stick to this strategy. For example, you can post something on Tuesday, Thursday, and Saturday. Once started, keep doing the same each following week. In such a way, you can educate your viewers and build their habit of checking out your updates three times per week. 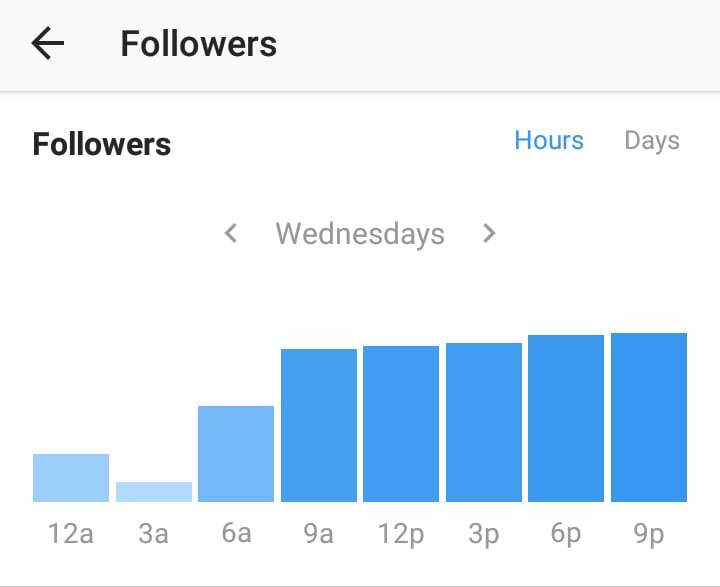 as per the time when my followers are more active on Instagram, stats show that I should better post between 6 pm and 9 pm on Wednesdays, and after 9 pm on Fridays. Based on the stats, I can decide on the most effective content strategy plan for my business Instagram page. That’s posting on Wednesday at 6 pm and Friday at 9 pm weekly. What Types of Content Will You Share? As soon as you decide at what frequency posts will appear in on your profile, think about what specific types of content you would like to share. The pro tip is to make up a plan of publications for every day when you post and keep stick to it. Thus, if you decide to share posts on Tuesday, Thursday and Saturdays, make certain that you share different pieces of content on those days. For example, you can share an informative and slightly educational post on Tuesday. On Thursday, you can share a 60-seconds video guide that is relevant to the services or products that you provide. On Saturday, you can close the week with an inspirational quote or a picture that will let the users get to know you and your brand better. You will be much more productive if you set up your working time in batches. Now, as you have decided on the major types of posts that you will share, you know how many educational posts/videos/quotes you will need for the following months. For example, you will need to prepare 4 videos for the following 4 Thursdays of the months. Film and edit them all in a row. This will deliver a sense of a sequel to your audience and you will stay focused on the things that you wanted to highlight in the set of video posts during the month. Do the same thing with the rest of the types of content that you have planned to post this month. This will save you lots of time and make it easier to focus on one specific thing without trying to cover all topics at once. The thing to remember is that people reach Instagram in search of the photo and video content. A small percent of Instagram users are ready to read long descriptions below the posts from the beginning till the end. So, if you want to keep people engaged with what you are posting, keep the captions short, relevant yet informative. What’s the main idea that you want to deliver with the help of that specific post? Keep stick to it as you write the caption. Keep it short, ask a question or add a CTA to the point. It gets so much easier to reach new followers and boost client base with the help of hashtags. Using both branded and general hashtags you can increase the user engagement with your posts and grow the users’ brand awareness. Remember that Instagram allows you to use up to 30 hashtags with every post, so you can use their power to the fullest. Geolocation is just another way to grow the users’ engagement on your posts. 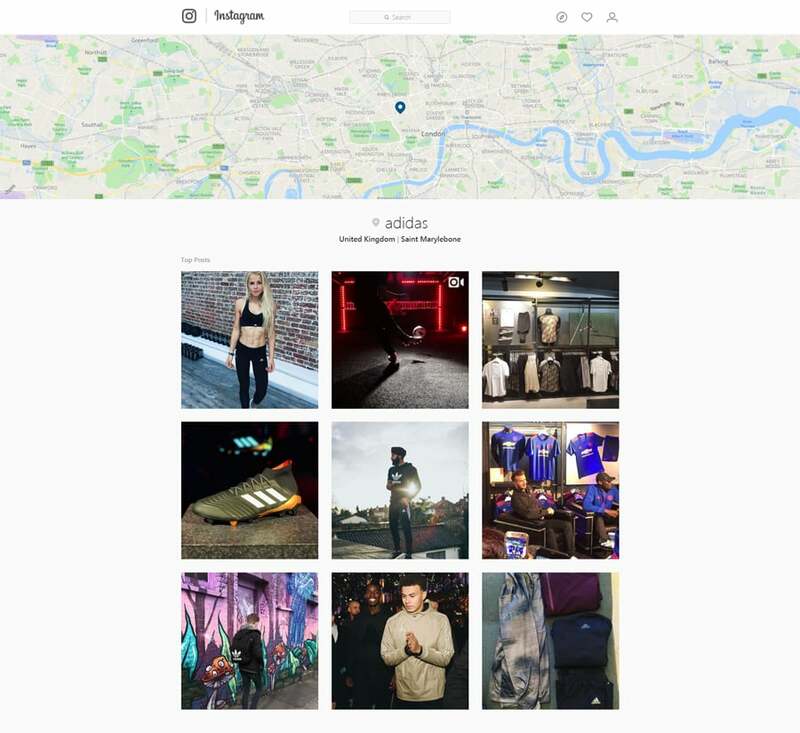 With its help, people can discover your brand through posts with a tagged location. In fact, such content receives 79% higher user engagement rather than posts without geolocation. As soon as you determine the best days and time of the maximum audience engagement, keep stick to the content posting calendar in order not to miss a single chance to interact with your fan base. Unfortunately, Instagram doesn’t include the features to schedule posts inside the app. Still, you can opt for third-party tools that will help you create, edit and schedule Instagram posts. This allows you to create content in advance and stay assured that none of the publications will miss the publication date. Later is being used by more than 600,000 of the world-known brands. This one of the top post scheduling tools of many bloggers, entrepreneurs, and small businesses. The Free Forever plan lets you schedule up to 30 photo posts (not video content) per 1 Instagram profile each month. In addition to planned posting, the tool also lets you manage comments on the photo-sharing platform. Tailwind is mainly known as an automatic post scheduling tool for Pinterest. However, it also supports Instagram content scheduling. It won’t publish posts on your behalf. Instead, it will send you push notifications to your smartphone with the post details. It requires some manual actions from your side before scheduled posts go live. Still, it’s pretty usable. 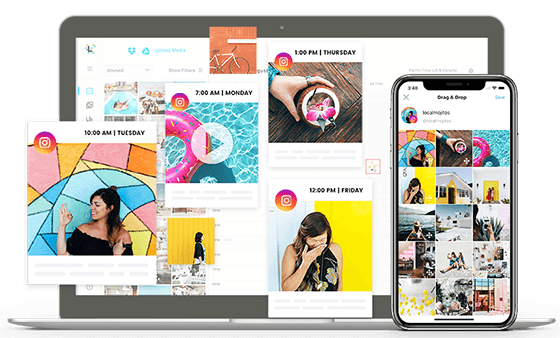 Planoly is a useful Instagram post scheduling tool, which allows you to upload your content, write captions, and schedule publications to go live on your behalf. The tool also offers built-in tracking post tracking features, which allows you to get a better understanding of the preferences of your community. As soon as you build your own Instagram content plan, keep stick to it and track. Find out what content is in the higher demand with your audience. Do not miss an opportunity to run A/B tests in order to discover what content results in the higher user engagement. The tricks and techniques that work for one brand will hardly fit another one. So, be unique and develop a versatile Instagram content plan. Stand out from your competition, be valuable and relevant to your followers in every post you share. Do you find these Instagram post ideas for business useful? Are there any other smart hacks to create an Instagram content plan? Please share your ideas via comments.